Bob Paladino & Associates is proud of the accomplishments of our business and our partners. Below, you'll find just a few of the recognitions earned. Bob E. Paladino, former SVP Global Performance Crown Castle International, accepts the globally recognized Hall of Fame Award on behalf of the company from Drs. Kaplan & Norton, creators of the Balanced Scorecard and directors of the Balanced Scorecard Collaborative. Hall of Fame criteria focus on companies that successfully implemented 25 Best Practices and achieved breakthrough results. Selected recipients include BMW, Mobil, Hilton Hotels, Royal Canadian Mounted Police, and the US Army. Bob, former SVP Global Performance Crown Castle International, accepts the nationally recognized Best Practice Performance Management Award behalf of the company from APQC CEO Carla O'Dell. Best Practice Partner companies have successfully implemented programs to drive significant results. The City of Coral Springs is a municipal corporation-a city government following a corporate management model. Coral Springs is a centrally planned community incorporated in July 1963. The population of 131,257 makes it the 13th largest city in the State of Florida. 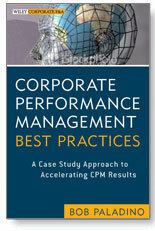 City Coral Springs is a case company in the "Five Key Principles of Corporate Performance Management" book.